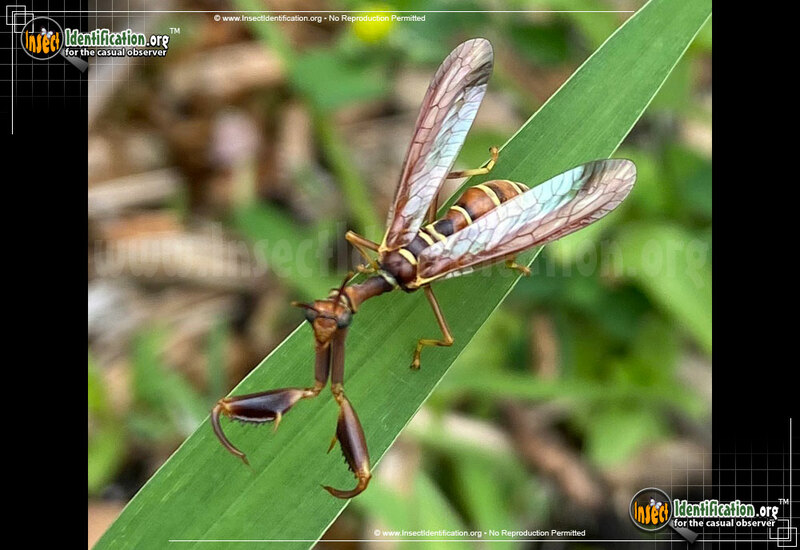 Detailing the physical features, habits, territorial reach and other identifying qualities of the Brown Mantidfly. It looks like it's part wasp and part brown mantis, but the Brown Mantidfly is its own kind of special insect. At first glance, Brown Mantidflies can be mistaken for a wasp. The alternating yellow, black, and brown bands on the abdomen and hairless body seem like obvious indicators. Even the vein pattern on its wings is similar to that found in the wasp family. There is a bit more physiology to the Brown Mantidfly though, and closer examination reveals a strange mix of features not often seen in one insect. They have a long, large prothorax ('shoulders') with forelegs made famous by the Praying Mantis. It contains a single claw that is used for capturing small insects. The female has an ovipositor, a syringe-like tube used to lay eggs, at the tip of her abdomen. Indirectly, the Brown Mantidfly is a natural enemy of the Wolf Spider. After hatching from their eggs, Brown Mantidfly larvae inconspicuously make their way into a female Wolf Spider's egg sac while it under construction. Once sealed inside, the Mantidfly larvae begin feasting on the spider eggs. Adult Brown Mantidflies emerge from the spider's egg sac once they have fully matured. Sightings of Brown Mantidflies are rare, but when they are spotted, they certainly leave an impression. They are most active from spring through summer and prefer marshes, grasslands, forests and open fields.